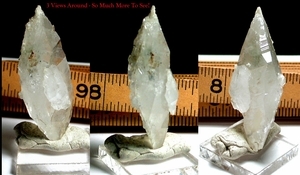 1/2"x 1"x 2-1/4" - rare dogtooth habit, doubly-terminated Arkansas rock crystal has a multiple-stepped [rare] face opposite a triple-faced face and a pointed hat of drusy quartz. The opposite, penetrated termination has layered faces and record keepers. Rainbow barnacle crystals partially obscure a green chlorite phantom, however; a nice group of chlorite inclusions 'floats' to be easily seen. A 1/2"x 7/8" stacked/twinned tabular doubly-terminated crystal rests on the host's slightly elestialled broad side, tucked into its' bends. No damage by man.